Apple Pay EMV terminal advertisement. Apple Pay is currently available only in the United States.” Let’s review the ad and the landing page at http://link.emlservices2.net/u.d?bYGu4iinutyt1X88jzB=1. The merchant fees advertised by Total Merchant Services, a First Data ISO, are 1.59% plus $.19 per transaction. The fine print of the offer is not shown. However, this type of offer is for ‘bundled’ pricing. That means it starts at a low retail swipe rate for certain cards, but other types of cards and key entered transactions will be at a much higher rate to achieve the desired profit margins. Nothing wrong with making a profit, but this type of plan is only suitable for certain small retail businesses because bundled pricing always costs more than interchange plus pricing. Additionally, they’ll need to recoup the cost of the free terminal either through a long term contract or high profit margins or both. 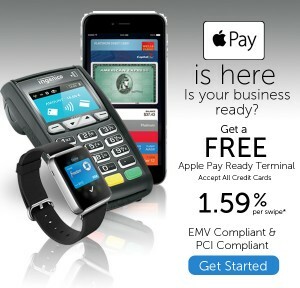 The ad message is clear that your business needs to be ready for EMV Compliance and buying this terminal will get you there. While the terminal is EMV ready, as of today, the unit has not been EMV certified on First Data. Since they’re promoting it, someone is probably working on the certification, but for now, the terminal is EMV capable, or in their words “EMV Compliant”. “YOU will be RESPONSIBLE for CREDIT CARD FRAUD if you do not have an EMV-compliant terminal by October 2015.” Beginning October 2015, either the issuer or merchant that is the cause of a contact chip transaction not occurring will be financially liable for any resulting card present counterfeit fraud losses. Lost and stolen card use is not applicable for Visa, but is applicable for MasterCard. The card brands also have differing exceptions and extra incentives to encourage adoption of EMV. Refer to EMV deadline misinformation is rampant for more information. Is it an Apple Pay Terminal? That’s just sales jargon. 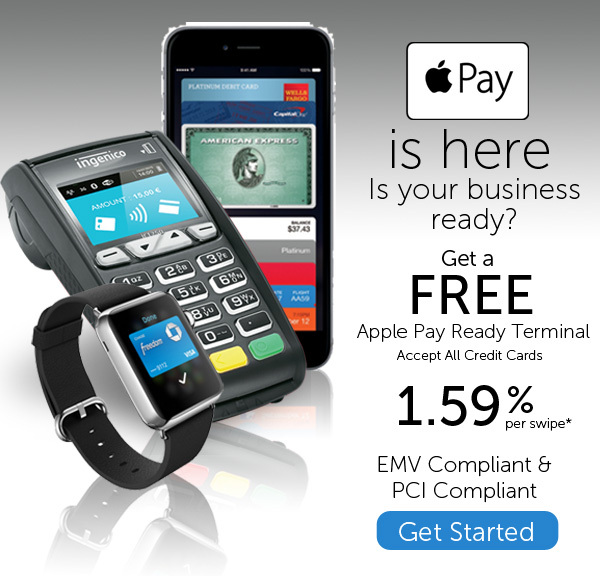 The terminal supports NFC or ‘contactless’ payments, including Apple Pay and Google Wallet. 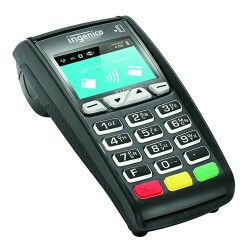 Ingenico iCT250 emv capable countertop terminal. Note, the iPhone and iWatch are not included and it’s not a mobile terminal. The Apple products shown are items that consumers can use to make payments with Apple Pay. In summary, nice ad, and easy way for small businesses to update their terminal with a quality brand. If you like their deal, I’ll match any offer they make – and offer an additional incentive- because I know it’s going to be profitable! My core customers process over one million annually; They’re not required to change processors and this isn’t the solution I’d recommend for them. This entry was posted in Equipment-POS, Merchant Services and tagged Apple Pay, EMV terminal, ingenico by Christine Speedy. Bookmark the permalink.